One of the best pedigreed high type bulls..right back to Dellia. DORON dtrs have outstanding temperment. High Component Production, +0.10% F. +0.01% P . He has been a breed Leader...for type. He had one of the highest progeny proven type proofs of any Regancrest bred bull and was one of the top bulls in the breed. 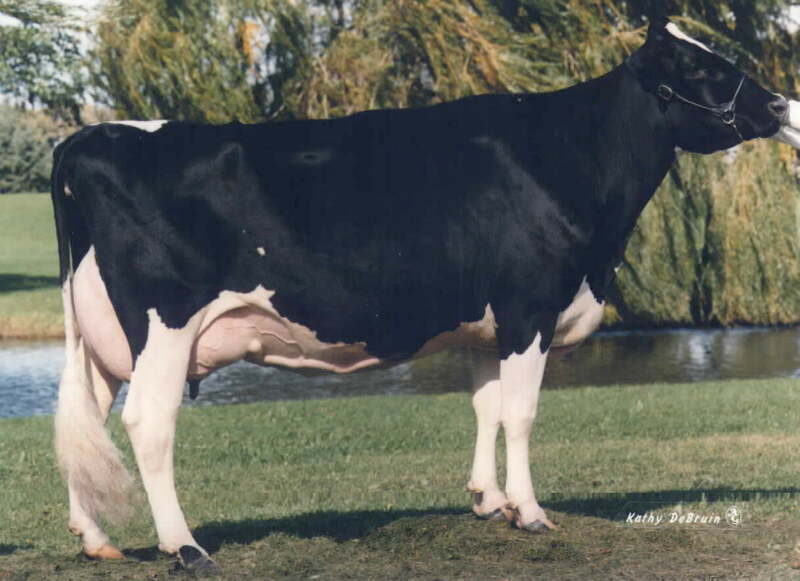 From the best and most exclusive branch of the Dellia family...thru Jed Deborah EX(95) over 250,000lbs milk lifetime! DORON Dtr.......HBD Doron 131, EX(93)2E, EX(94) Mam.@6yr. DORON Dtr...HBD Doron 131, EX(93)2E, EX(94) Mam @ 6yr.! Her dam was not classified, but was a dtr of Zeplin, a Mandel gr.son of Zita,EX(94)2E,GMD, ZADE's gr. dam! Bred by Holton Brothers, KS. Now owned by Neil Ledden, WI. Congratulations to both! Good calving ease bull, 8.5 & 8.9, plus hard to find ..+2.00 stature! Doron's sire stack....Convincer EX(95),VG(2yr)WADE, EX(95)Jed, EX(94)Blackstar, EX(95)Mark(Dellia), next dam EX(90)Bell dtr. 194 dtrs / 73 herds, 94% Rel. +0.22 F&L, +0.95 Body, +1.28 Dairy Comp. Dtrs. avg. 80 pts Actual, 83 pts Age Adj. AI proven, No... breeder/syndicate involvement of any kind. DORON dtrs. are very high producing with high components. Very tall (+2.00)...strong , Deep bodied , with open rib. The rump angle is correct, with some slope , the rump width is outstanding (+1.60). He is neutral on leg side view, straightens legs , Rear leg rear view and Foot angle are excellent! The udders are superb ! He was one of the breed's best progeny proven overall type improvers and will continue to excel. 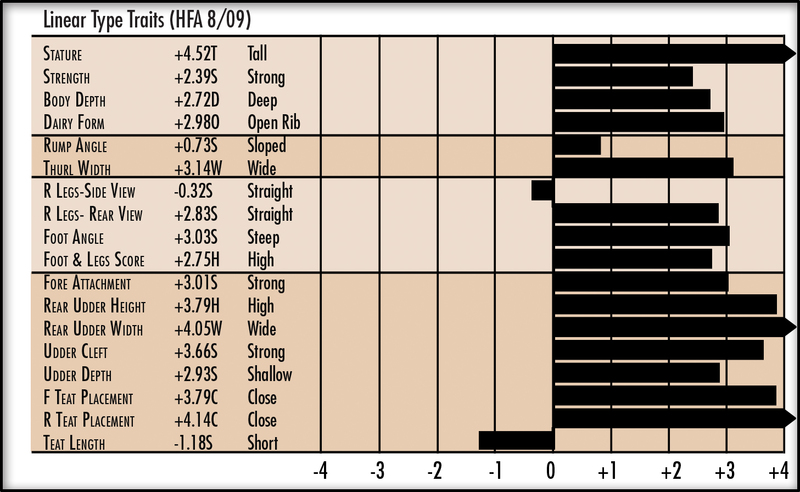 Pedigree: Princess Di EX(92), EX(92) Mam, EX(91) feet & legs ... probably Convincer's best all-around daughter is DORON's full sister. 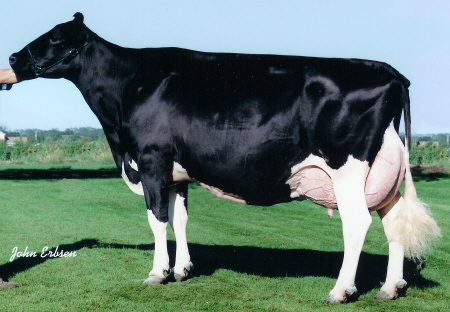 Their outstanding maternal granddam is Regancrest Jed Deborah 2E(95) , then the EX(94) Blackstar Darlene and then the great Dellia 2E(95) EX(97) Mammary! DORON's Full Sister....65 in. tall! EX(92),EX(91)Feet & Legs, EX(92) Mam.! DORON's Mat. Granddam...64 in tall! Regancrest Jed Deborah EX(95) 2E, 4th Gen Ex. Over 250,000 lbs milk lifetime! 2nd Gen. EXCELLENT, 2nd Gen. EXCELLENT Mammary! DORON looked like his Gr. Dam Deborah! As you can see, he was a very tall, FANCY......impressive bull and is siring the same kind of daughters. DORON's pedigree... the best in the breed CONVINCER EX(95) x VG@ 2yr.WADE dtr. x EX(95) JED x EX(94) BLACKSTAR x EX(95) MARK Dellia x EX(90) BELL. DORON represents the best of the latest generation Dellia family! He will be a top cross on many bloodlines, including other Regancrest breeding, particularly cows needing aAa 426 traits. DORON is an overall high component production and super type improver! Give us a call.....we will deliver promptly.